So on April Fool’s day, I assembled a Ultima Online Spring Producer’s Letter. I thought the fact that it was tagged “April Fools” and that the link at the top linked to the UOHerald.com April Fools joke was a give-away, but some people got pretty deep into it. A lot of it was a rehash of speculation I’ve made on UO in recent months, and a lot of it was things that I think EA and BioWare could easily address, but choose not to. Wow. That’s the only way to describe some of the emails I received. I had people angry at getting their hopes up. I had people who understood the sarcastic angle I was going for. I had mixed reactions in between. It actually hasn’t been online all that long. I originally published it in the afternoon, but then quickly pulled it, although some people using RSS saw it and one even asked me about. I reposted it in the evening. The reason was simple – I didn’t want it being passed around BioWare Mythic on a Friday afternoon, because I’m sure it would not go over well with them, and I wanted a chance to explain why I did it. I’m happy to say that most people saw it for what it was, a bit of a poke at how UO has been treated all these years, but satire doesn’t always go over well. This is not an apology though. Far from it, I want to be very clear about why I did it, because I don’t want it being dismissed as an April Fools stunt. I wanted to draw attention to a few things. It was not a callout to Calvin Crowner, the current UO producer. Although it may seem like it, that was not my intention. Most of how UO is treated as a game, and we as players, has to do with decisions made by people who are way above the UO devs and producer. I’m not going to let Cal off the hook though. What prompted me to write it was the Notes from the Head Hamster entry on UO Herald. I know Cal was trying to lighten the mood and have some fun with how we, as players, sometimes see things. Now while the April Fool letter was not a callout, you can take everything from here on out as a callout. Cal spent probably 10-20 minutes throwing that Hamster thing together. Many of us sat through the very short video and then the video House of Commons not long after that. Some of us even read the Facebook entry about the graphics update. We got very short clues in a very disjointed manner from all of that, and people are still confused. You basically gave us the future of UO, but it was done in a very unorganized and secretive manner. We all wondered what was cut out of the video, what the whispering was about in the House of Commons, why the video and audio were cut at one point. Those are from BioWare Mythic games – sister games to UO. Both of those are fairly short – having played and followed both games for a while, I’ve seen longer producer’s letters from both, such as the January Warhammer Producer’s Letter. They talk about things that are going to be happening to their respective games – some of those things, they get into discussions of things that might not happen for six months, in others they talk about what recently happened. 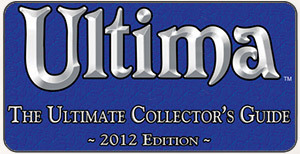 Part of my point in yesterday’s April Fools letter was this: UO’s sister games that are probably fairly close in subscription numbers to Ultima Online have producers and teams that keep the players informed about the future of their respective games, including things are pretty far down the road. 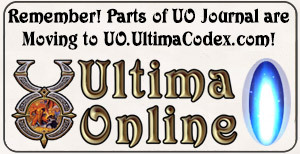 With Ultima Online, we are giving a video that was cut to pieces and then a House of Commons where UO was treated like a top-secret project that nobody can talk about even though it’s 13 years old and is not exactly a threat to any other MMOs. Cal, if you wanted a good April Fool’s joke, you could have given us a clear and brief summary of the graphics, quest, and new player updates, and where the future of UO really lies. Most of us would have stared at our screens in shock and disbelief.